This one year professional acting training conservatory program is designed for the professional, working actor. This intense, narrow scope of training program, is designed to build on the actor’s existing set of skills and take training to the next level. 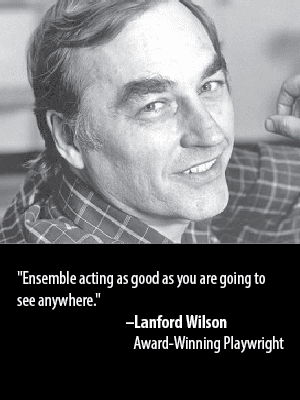 Students will work with The Barrow Group’s simple, effective tools, as compiled in Seth Barrish’s book “An Actor’s Companion”, which help an actor to find more ease, spontaneity, and clarity. The program culminates in a showcase directed by Seth Barrish and Lee Brock in our Studio Theatre. We are now accepting applications for the September 2019 thru June 2020 Program. Click on the Application tab above to learn more. After completing the One Year Professional Acting Program, students can apply for the One Year Actor Craft Expansion Program. The program continues with scene study and application of The Barrow Group tools and moves into specialty classes and applying the tools to film work and classical material. The spring moves into advanced scene study designed to facilitate self adjustment for the actor in scene work. The class will then shift into performance preparation – working on material and rehearsal for the showcase. We are currently accepting applications for the September 2019 thru June 2020 program. The cost of the program is $6,750 if registered by June 1, 2019. If registered after June 1, the cost is $6,950. A deposit of $2,000 is due upon registration. The remaining balance can be made in installments.